Hallux rigidus is arthritis of the main joint of the big toe in the ball of the foot. It is a wearing out of the joint surfaces. 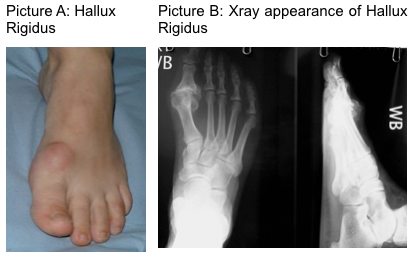 It is called “hallux rigidus” because its main feature is stiffness (“rigidus”) of the big toe (“hallux”). In most people there is no definite cause – it just develops. Probably the main reason why this joint is particularly subject to wearing out is that it is under tremendous stress in walking. With each step, a force equal to twice your body weight passes through this very small joint. In a few people it may be caused by an injury or another medical problem such as gout or an infection in the joint. A bony bump (“osteophyte” or “dorsal bunion”) may develop on top of the joint. This is your body’s natural response to the worn joint. The bump may rub on the shoes. In some people this is their only problem. Because of the painful big toe some people tend to walk on the side of the foot. This may produce pain in the ball of the foot or down its outside border. Sometimes the joint wears down more on the outer side, towards the lesser toes, than on the inner side. This may make the toe tilt towards the second toe, and the toes may rub together. Fortunately, in many cases, your toe will not get progressively worse, and (apart from your other toe) you are not much more likely to get arthritis in other joints, such as your hips and knees, than anyone else. – all the usual advice for good health in fact! There is nothing else that reliably helps. You can take simple pain-killers for the pain if it is bad and interfering with your life. Try paracetamol first as side-effects are rare at the correct dosage. If this does not work your doctor may prescribe stronger pain-killers or anti-inflammatory medicines if these are considered to be safe for you. Because the joint is usually most painful when the toe is bent upwards during walking, it sometimes helps to stiffen the sole of your shoe so that it does not bend while walking. If you do this, you may need a small “rocker bar” on the sole of your shoe so that you can rock over this while walking instead of bending your toe up. This can be organised for you by an orthotist or chiropodist. One disadvantage of this treatment is that the stiff insole may push your osteophyte up against the shoe. 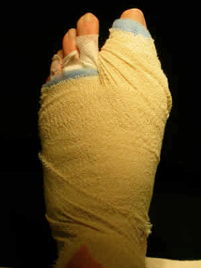 If the toe remains very painful, sometimes injecting some steroid mixed with local anaesthetic into the joint can help. This reduces the inflammation inside the joint. The injection can usually be given in the outpatient clinic, although sometimes you may have to come into hospital as a day patient. The toe may be painful for a few days after the injection and any improvement has usually occurred by a week. The effect can last from a few days or weeks to several months. Occasionally the improvement can be permanent. If only the upper part of the joint is involved, the upper part of the joint can be trimmed out and the joint washed out (cheilectomy). Most people who have a cheilectomy get less pain and a useful improvement. In about 75% this improvement is permanent. The others develop worsening of the arthritis over the following years and some will eventually need another operation. In certain circumstances, it may be appropriate to consider a replacement joint. There are a number of joint replacements available, although they are only appropriate in certain patients. As with all joint replacements, there are risks with the procedure. In particular there is a risk that the new joint may loosen or wear out, in which case a more complex procedure may be necessary. Your surgeon will of course, discuss this with you. This operation is usually done as a Day Case operation and you will normally be able to go home the same day. You will have a bulky dressing around your foot after the operation, which looks like this. 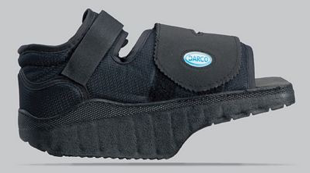 You will be fitted with special shoes (Darco™ shoe) that will allow you to walk on the heel of the foot which has had the operation, with crutches for support. You will be sent home with painkillers to help with any pain you may have. You will be seen 2 weeks after your operation in clinic to look at the operation site and to make sure that there are no problems or concerns. At 6 weeks, you will be seen again in clinic and have an X-Ray done to check that the position of the bone and healing of the bone has taken place.